John Irvin Wiebe was born to Ben and Tina Wiebe at home on the farm near Edrans on December 17, 1951 with Dad's Aunt Helen Fehr acting as midwife. John was born with a smaller than normal brain. He developed slowly physically, but he did not get past about 3-5 years of age mentally. He lived at home with Mom and Dad until he was 28, at which time he was moved into a facility, now known as the Manitoba Developmental Center, in Portage la Prairie. 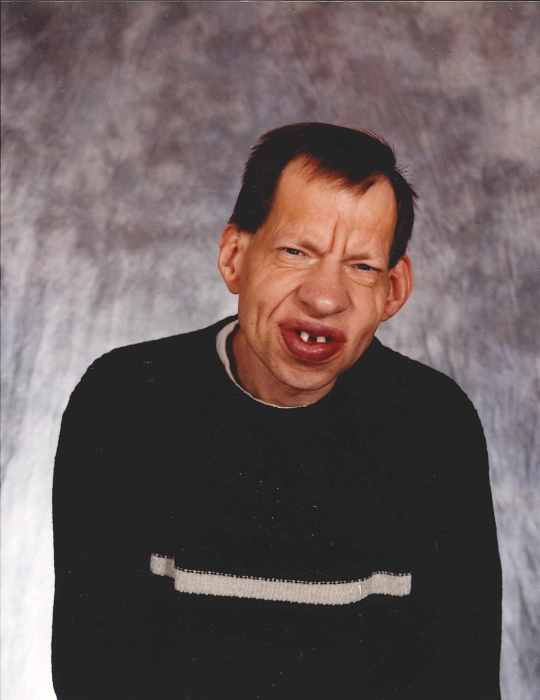 After a few years in Portage, a group home, Pine Creek Residence, became available for John to move into. He was the first one to move into the PCR. He got to choose his own room. It was the one which overlooked the street and the driveway. He loved to see people coming and going. He would enjoy honks and four-way flashers as people came and went. PCR was his home for 30 plus years. He loved his place. He got to go to summer camp, to the Threshermen's Reunion, and on many outings. Life for him was good. The caring home atmosphere at PCR made him feel much accepted. One of his last outings that gave him a lot of enjoyment was the Classic Car Show on July 1, 2017 right in Austin. It was a pleasure to watch him examining the engines, ignitions, and door handles of the lineup of beautifully restored cars and trucks. He had a wonderful day. On Thanksgiving Monday of 2017, John had emergency surgery for a bowel blockage. The surgery did not go well, and as a result, he was mostly in hospital for the next 8 months with short times at his residence. On June 6, 2018 John was moved into the personal care home in Gladstone. He was there for just under three months before his passing on August 29, 2018 having reached the age of 66 years and 8 months. Thank you to the staff at Pine Creek Residence for caring for John over all the years he lived there. You were like a family to him. Thank you to all of John's friends and relatives who made his life enjoyable with visits, kind words, gifts, and rides around Austin, even if he had to ride in a FORD once in a while! Thank you to the staff at Third Crossing Manor in Gladstone for the kindness you showed John even for the short time he spent there. Your compassion and caring for him and for us will not soon be forgotten. John was predeceased by baby brother David 1958, Dad 2003, Mom 2014, and by brother Alvin 2016. He is survived by his siblings and their families Diedrich and Helen Toews, Glen and Sharon Wiebe, sister-in-law Sherryl Wiebe, Marg and Bill White, Ruby and Earl Caswell, George and Karen Wiebe, Barry and Darla Wiebe, Marvin and Lorna Wiebe, Bruce and Carol Wiebe, Phillip and Karen Wiebe, and Connie and Les Toney. John's life has certainly had an impact on the Wiebe family. We hope that in his own special way he has touched many of you as well. We will miss you, John. You have finished your course with courage and grace. God has taken you home to eternal joy where there is no more pain or sadness. We love you, John and we will see you again someday.